From his real name Jean-Jacques Waltz (1873-1951), Hansi was a painter, a draftsman and a caricaturist. Before and during the First World War he exercised his verve against the Germans who had annexed Alsace in 1871. Jean Jacques Waltz was born in Colmar in 1873, 2 years after the annexation of Alsace by Germany. He is the son of Andrew Waltz, a butcher who became librarian and then curator of the Unterlinden museum. After studying at the Beaux-Arts de Lyon from 1892 to 1895, where he discovered that he felt nostalgic for France, he returned to Alsace and worked as a textile designer, first in Cernay and then in Logelbach. In 1909 he resigned to devote himself exclusively to drawing. The work of the man, who took as pseudonym "Hansi" in 1907, was affected before the war by a deep anti-Germanic feeling. 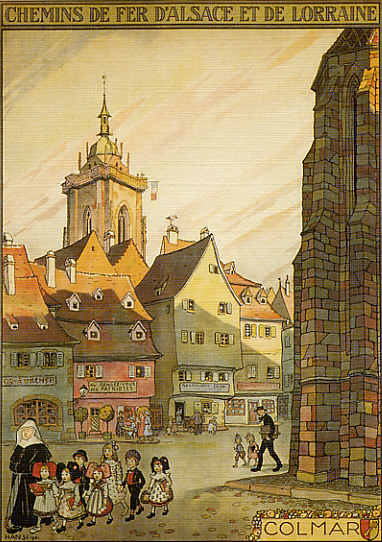 His works « der Professor Knatschke » (1908), « L’Histoire d’Alsace racontée aux petits-enfants par l’Oncle Hansi » (1912) or « Mon village, Ceux qui n’oublient pas » (1913), all show a strong attachment of Alsatians to France and their desire to become French again. Imprisoned at the beginning of the Great War, Hansi escaped and joined the French army to become translator in a service of propaganda. After the war, he presented in its various publications like “le Paradis tricolore” (1918), “l’Alsace heureuse” (1919) or “Colmar en France” (1923) the image of a patriotic Alsace which was happy to be French again. But this idyllic image of a rural, wonderful, pleasant, red, white and blue and somewhat backward-looking and folkloric Alsace did not correspond to reality. Exceeded by the misunderstandings between the French administration, who wanted to clear 50 years of German occupation, and the Alsatians, who wanted that their cultural specificities were recognized, Hansi, whose work had helped to hide the extent of the disagreement, gradually leaved the public arena. He made the choice of the future by talking to children as "Uncle Hansi," in “La Merveilleuse histoire du bon Saint Florentin d’Alsace” (1925). 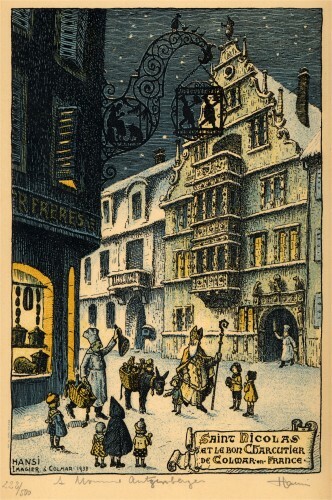 If he succeeded to his father as curator of the Unterlinden museum, he also showed great activity in advertising, particularly among the “Mines domaniales de potasse” of Alsace, where he designed a new logo and many postcards. Hansi, known for his anti-Germanism, first fled in Burgundy and then in Agen, where the services of the prefecture of Haut-Rhin were, after the declaration of war in 1939. Caught by agents of the Gestapo, he was beaten on the night of 10 to 11 April 1941 and left for dead. After a visit in the south, he found shelter in Lausanne (Switzerland), where he would wait the end of the war to return to his native Colmar. He died there June 10, 1951.